How long have you been working in the industry? I’ve been working as a pastry chef for five years. Currently, I oversee the pastry department at the Equinox, and work with a team to research and develop new desserts. Every two to three months, we’ll change the menu and introduce some new desserts. How did you get started with pastries? I was in the Pharmaceutical industry before, because I thought that it would be better for me to pursue a more knowledge-based career, especially in Singapore. But I wasn’t sure I wanted that to be my career for the rest of my life, so I decided to hop over to something I was more interested in. I’ve always enjoyed creating and designing things and I was intrigued by how food and pastries always looked so nice – that was how I got interested in pastries. I figured that working with desserts would allow me to be more creative. So I took up a Diploma course in pastries, and embarked on a new career path. It’s been really exciting so far, and I haven’t looked back since. Do you specialise in a certain type of dessert? My specialty is sugar. I work with sugar and high heat, and mould them into sculptures by hand. Once I have an idea of what I want to make, I start building it from scratch. It takes a lot of time, research and experimentation for a whole piece to go out. What do you enjoy most about what you do? I like that I can make my ideas a reality. Any new dessert I can think of, I can put it on the table. I feel there’s quite a lot of flexibility and room to explore new things. Is there any creation that you feel is particularly memorable? I once made a Banana Opera cake a few years ago. I don’t think any other place had it until recently, but the feedback I got was good. And it actually became my longest-serving dessert. The fact that I was among the first chefs here to create it also made that particular dessert quite special for me. How do you think making pastries contributes to making a guest’s stay more enjoyable or memorable? If I can create a dessert that guests really like, it can make their day better or even make them want to come back for more. Our desserts are mostly seasonal, but sometimes, we’ll create special desserts for regular guests if they have specific requests. You’ve had the opportunity to participate in a few competitions – both locally and overseas. What was the experience like? It was challenging physically and mentally draining. In order to take part in overseas competitions, you have to first participate in a selection contest among all the hotels in Singapore. I practice for about five to six months for competitions, constantly improving my technique and thinking of new ideas. Usually, on the day of the competition, adrenaline will kick in and my training takes over. Everything I’ve practised will just naturally flow through my fingers. Everyone in my surroundings disappears, and it feels like my partner and I are the only people in the room. 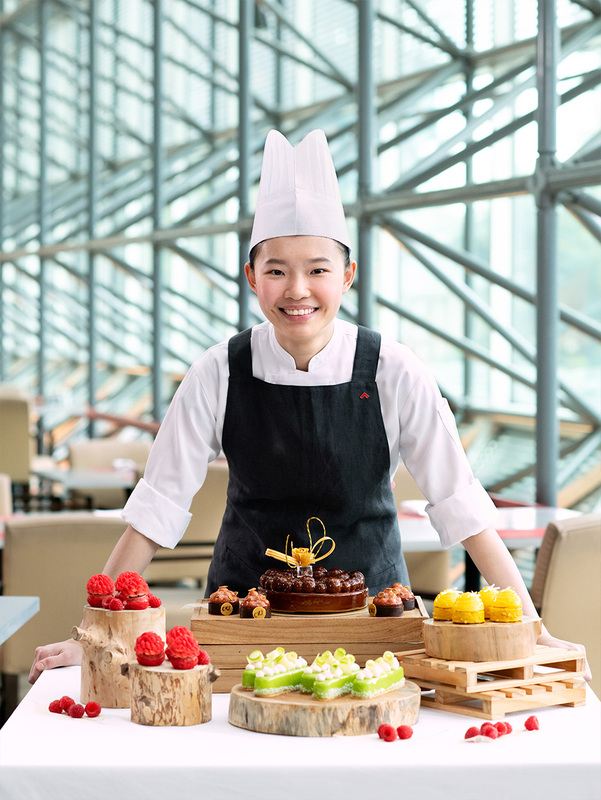 Thankfully, I was awarded the Best Lady Pastry Chef title in my first competition back in 2015, and was given the honour of representing Singapore in an international competition in Paris the following year – where I received the Best Press Award. But it’s not just about winning. I always give my best, so no matter the outcome, I will be contented. How did you feel when you won those competitions? More pressure, actually. Because the next competition is only going to be more difficult. So I feel there’s a lot of pressure for me to do well. How do you find the time to practise to prepare for such competitions? We usually practise after work. We'll finish work at 6pm, then we’ll continue our practice until as late as midnight, and then we come back to work the next day. That’s the tough part of joining such competitions – you have to wake up really early after a late night of practice, and it can get quite mentally challenging. Some other pastry chefs also take part in competitions and we make it a point to encourage each other. I get a lot of support from the senior chefs. So you get a lot of opportunities to try new things? Yes, we’re given the opportunity to push ourselves and to maximise our potential – even when we’re juniors. But on top of that, I feel that you need support too. Thankfully, I get both of that here. What have you learnt since you joined the industry? There are different things to learn at every milestone in your career. For example, when you first start, you learn how to do things more consistently. Then you learn how to lead your juniors. Then you get to learn how to manage a team, like rostering, for example. So you don’t just learn how to make desserts, there’s actually a lot more to learn behind the scenes. Do you have any words of advice for people who are looking to join the hotel industry? I think you need to be very self-motivated, and you need to persevere in whatever it is you’re doing. It can be a tough industry, but just go on and you’ll get to where you want to be eventually. Just be passionate and driven.